Thanks to better marketing, environmentally certified homes are attracting more interest from buyers. Sales data for environmentally certified homes first became available in 2007 in Western Washington, after the Northwest Multiple Listing Service included environmental certification check boxes. Now, real estate agents can note whether a home has certifications from Built Green, Energy Star, LEED for Homes or third-party verification. Agents can also download the certification as an attached document to the listing. 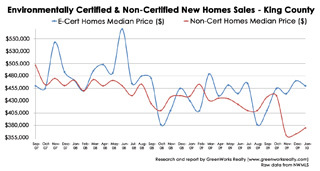 GreenWorks Realty regularly monitors and tracks NWMLS data for homes that are environmentally certified, and publishes an ECert Report that compares the median sales performance of e-certified homes with non-certified homes. The difference is notable and growing. Data show distinct differences in the performance of certified homes, with a pronounced difference the last three months in King County. Since most e-certified homes are new construction, only homes built 2007 and later are included in the ECert Report comparison. Since 2007, the median sales price of environmentally certified homes in King County has usually remained above that of non-certified homes. In Seattle the report reveals that certified homes made up 33 percent of the new home market, sold for a 9.1 percent premium per square foot and were on the market for 24 percent less time. Further, from November 2009 through January 2010, King County non-certified homes continued to decrease in value as certified home values increased. Remarkably, green homes carried a $92,175 price premium, were 12.3 percent smaller and continued to sell in less time than a non-certified home. In Seattle, third-party verified homes, which are often a “deeper green” home, sold for 23.5 percent more per square foot in 10 percent less time and make up 6 percent of the market. During the Appraisal Institute’s fall conference in Seattle last December, 40 residential and commercial appraisers attended a session where they learned about these statistics for the first time. It was eye-opening for appraisers to hear that in July 2009, two years of steady growth in market share of green homes culminated in over 49 percent of new homes sold that month with a certification. Over 50 percent, and appraisers will be required to discount any home that is not green, as that will have become the market norm. This performance is notable as some of the first statistical evidence in the country of a clear premium and value ascribed to green homes by consumers. The reasons why buyers favor e-certified homes are not rocket science, but people have different motivations. Some buy as a commitment to reducing climate change with the higher energy efficiency that green homes offer. Others buy because the homes are built with nontoxic materials, which makes the indoor-air quality cleaner than their traditional counterparts. Green homes are built with more environmentally sustainable products, lower waste during construction and require less maintenance over time. Money saved on monthly utility bills can be put towards a mortgage to afford a higher-performing home. This math is the basis of the federally insured “energy-efficient mortgage,” which relies on a Home Energy Rating System to quantify utility savings. Buyers view homes with greater energy efficiency to have a higher value, much as consumers have driven up demand for fuel-efficient cars while the SUV market has constricted. With each article citing the loss of polar bear habitat or rising oceans as the climate warms, the demand for lifestyle choices that reflect a changing world grow. Climate change is a long-term trend. Home buyers may know they are interested in a green home, but few have information about what makes a particular home green, or what it’s worth to their pocketbooks. At the point of sale, the transfer of information to buyers can be challenging. A 2009 report by Sterling Hamilton, who studied green home marketing in Puget Sound, notes that there was a 14 percent difference in sales price between green properties actively marketed green by real estate agents versus green homes not actively marketed as green by real estate agents. As agents learn to market e-certified homes, premiums will continue to grow, home buyers will continue to learn of the benefits of green building and the cycle will continue. Buyers are using certification programs to increase the value of their home improvements by prioritizing easy to make energy-efficiency improvements such as insulation and air sealing. Certification programs are adding energy retrofit checklists to correspond with their remodeling checklists. Local investor G2B Homes is purchasing distressed properties, prioritizing sensible energy improvements and marketing and selling their homes using energy labeling (similar to miles-per-gallon stickers for cars). It’s not too large a leap to price a green premium similar to that found in the new home statistics into G2B’s pro forma. Since July, the percentage of e-certified homes in the market has declined slightly after several years of increasing market presence. Many builders may choose to build green but cut costs by not certifying their homes. This is a mistake, as certification agencies play a critical role in growing market awareness and educating buyers and agents. Developers, builders, architects, mechanical and civil engineers, and even real estate agents and marketers, need to be involved in the design and construction process to maximize value, prioritize green features in their projects and make use of certification programs to help the marketplace understand the features in their homes. Green agents have a particularly useful role to play as change agents to help lead America toward energy independence. Our nation’s residences account for 16 percent of total U.S. energy consumption. As our nation debates the future of energy use, the safe return on investment is capitalizing conservation as part of larger holistic plan. Insulating and air sealing homes is a significant part of conservation. Changes such as the city of Seattle’s promotion of home energy labeling will shine light on homes that score well, which will lead to homeowners further prioritizing and valuing energy performance improvements. The conversation on whether green and energy-efficient homes have greater value is a crucial one. One thing for certain, e-certified home sale performance in King County and Seattle, driven by locally successful certification programs, is a potent indicator of how green homes outperform in our market. Ben J. Kaufman is the owner and broker of GreenWorks Realty, author of the ECert Report and board chair for Built Green of King and Snohomish County.